Some of the 5,000+ conference attendees seemed unsure at first, but a majority took us up on our request and learned an important message along the way. 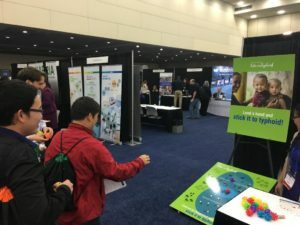 The objective of the game was to throw a sticky suction-cup ball at a board, aiming to stick it on the “integrated approach”, where water, sanitation, and hygiene (WASH) interventions overlap with typhoid conjugate vaccines (TCVs). As we explained, landing on WASH or TCVs is still a win, but having BOTH wins the top prize. In our case, that was just a piece of candy; in real life, an integrated approach means children’s lives saved and suffering prevented. 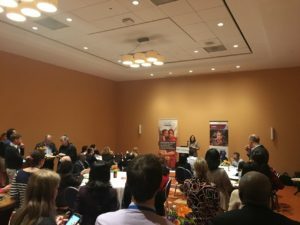 Dr. Denise Garrett from the Sabin Vaccine Institute gives remarks at the Take on Typhoid reception at ASTMH. 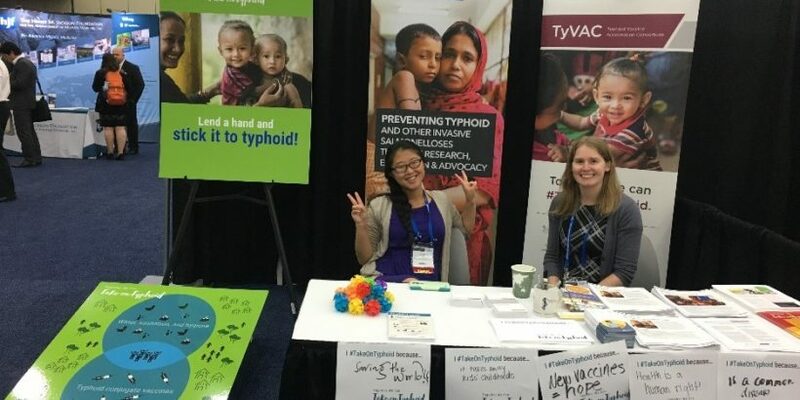 Throughout the week, Take on Typhoid members at ASTMH also presented a variety of research posters, held two typhoid symposia—Antimicrobial Resistance: Transforming Diseases of Poverty into Global Threats and Controlling Typhoid Disease: New Insights on Vaccines and Vaccination Strategies—and held a reception on Wednesday evening focused on integration and innovation to take on typhoid. A lot of new research at the conference centered on the promising impact of TCVs, especially given the rising threat of drug resistance and the World Health Organization’s Strategic Advisory Group of Experts on Immunization (SAGE) recent recommendation for countries to introduce TCVs. WASH experts also presented their newest findings on the impact of WASH interventions on preventing typhoid and other enteric infections. While the vaccine and WASH sectors have historically been separate, we were encouraged to see WASH being discussed in conjunction with vaccines, drugs, and other interventions for a variety of diseases and issue areas at ASTMH. Most participants responded positively to our integration message in the game. Questions about vaccines were brought up during the WASH sessions, and vice versa. 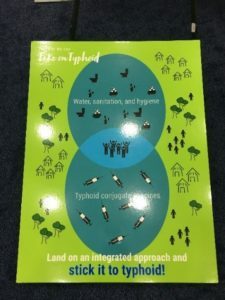 The integration message is an important one that we need to keep communicating, but it’s one that is neither new nor unique to typhoid. 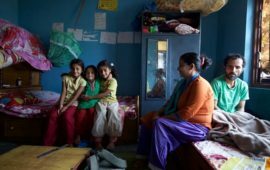 It’s a key strategy across several disease elimination efforts, including diarrheal disease, pneumonia, neglected tropical diseases, and more. We also heard a lot of discussion about the need to integrate disease elimination efforts with other sectors—not just water and sanitation, but also education, infrastructure, and technology. 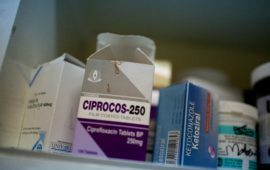 Typhoid is a complex disease that impacts infants, children, families, travelers, governments, scientists, and businesses at a crossroads of risk factors, including poverty, education, health access, drug resistance, water, sanitation, hygiene habits, and food safety. These risk factors do not occur in silos, so our approach to take on typhoid shouldn’t, either! Moving beyond silos is the new goal in global health, as well as the theme of RTI International’s #BeyondSilos ASTMH Twitter chat that we took part in on Tuesday. So, what do you think? While there may not be a one-silo-fits-all solution to typhoid, we know how to take it on. We are armed with vaccines, WASH, and evidence that they work—especially when they’re together. But we need your help to expand our reach, continue innovating, and bring in more sectors. Will YOU help us stick it to typhoid? Laura Kallen is a Senior Scientific Communications Associate at PATH.